who has hands skilled enough to knit together tiny veins and hearts, feet that are always busy with one hobby or another, eyes always watching to teach and protect, a lap always eager for a cuddle with a grandchild, and a heart so big he’d give you the shirt of his back? and one of the brightest highlights of this year “at home” is the time that my kids and i get to spend with him. my pops is one smart dude and has so much to show and share. he really knows about so many different cool things, and i’m so glad that my boy gets a chance to hang with his papi, making memories and building his brain a bit too. i think just so far, they’ve covered polarity, built a solar light, reloaded bullets, worked on marksmanship, fixed a broken sprinkler pipe, and designed a remote control car. and we’ve been here about 6 weeks. needless to say, he’s learning things from my dad that he probably wouldn’t learn from either me or my husband! but that’s what grandparents are for, right? my middle kiddo has her own art space in his out-building, with her creations and their joint art projects proudly on display. the little bitty has renamed him “bot”. and man does she love her bot, handing out hugs and kisses like no grandchild before her. i was very grateful to spend father’s day with him this year… and he was a great consolation prize for the kids not having their own daddy close by. (though i’m ever grateful for skype!) we had a wonderful day that started with kite flying… and ended with this darn good dessert. my dad has forever loved german chocolate cake. he’d request it at every opportunity… and funny enough, my mom is not a fan. her argument is that it’s just not chocolate-y enough. 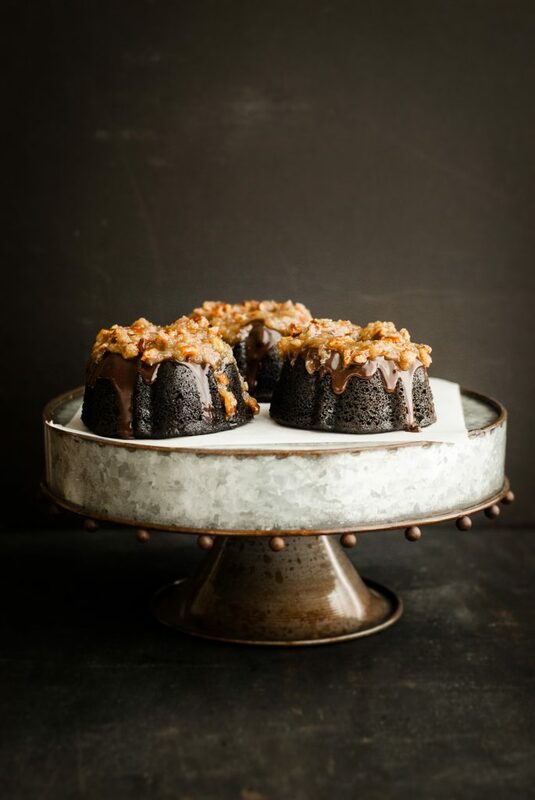 so like i do, i took it on myself to meet all of the criteria… german chocolate cake for father’s day, with extra chocolate kick for mom, grain-free for us all, and a smaller bite dessert for the recipe redux. you see, those recipe redux ladies have challenged us this month to post a small bite dessert in honor of their sixth year of rounding us up. happy birthday, recipe redux! 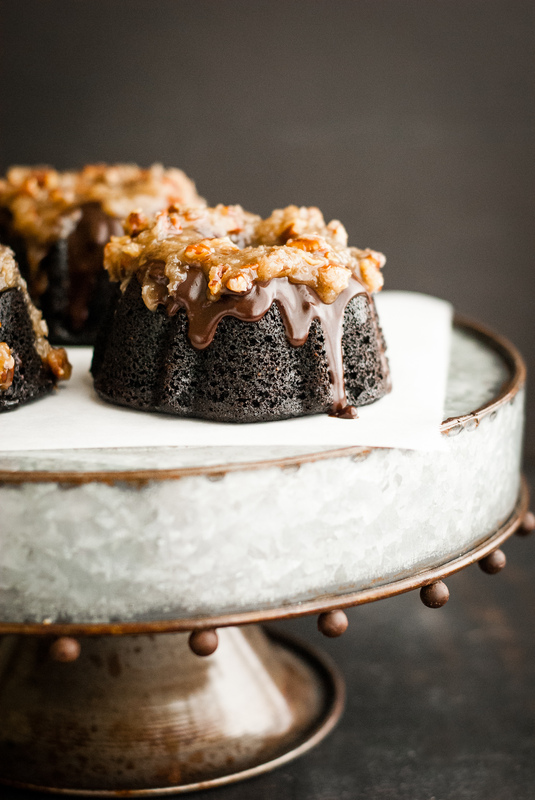 and i’m thrilled to report these phenomenal grain-free german chocolate bundt cakes were a tremendous hit here at my house. people were sneaking bites, asking for more, and begging that they be made again already. i think that’s success. so this one is papi’s/bot’s cake… a great dessert to honor a pretty exceptional man! Combine almond flour, cocoa, whey protein, baking soda, baking powder, salt, and xanthan gum in a medium bowl. Combine softened butter, honey, eggs, milk, coffee, apple cider vinegar, and vanilla in another medium bowl. Stir with a wire whisk until well-combined; Add egg mixture to almond flour mixture and stir thoroughly until well-combined. Pour mixture evenly in the wells of a 6-mini-bundt cake pan that have been well-greased or sprayed with cooking spray. Bake at 350° for 20 minutes or until a pick inserted in the center of the cakes comes out clean. Allow to cool for 10 minutes in the pan. Invert cakes onto a wire rack and allow to cool. Put chocolate chips in a medium bowl. Heat cream over medium heat or in microwave until steaming. Pour cream over chocolate chips; allow to sit for 1 minute. Stir well until chocolate melts and mixture is smooth. Place butter, cream, salt, brown sugar, and vanilla in a small saucepan. Heat over medium until butter melts and mixture combines well. Remove from heat; stir in coconut and pecans. 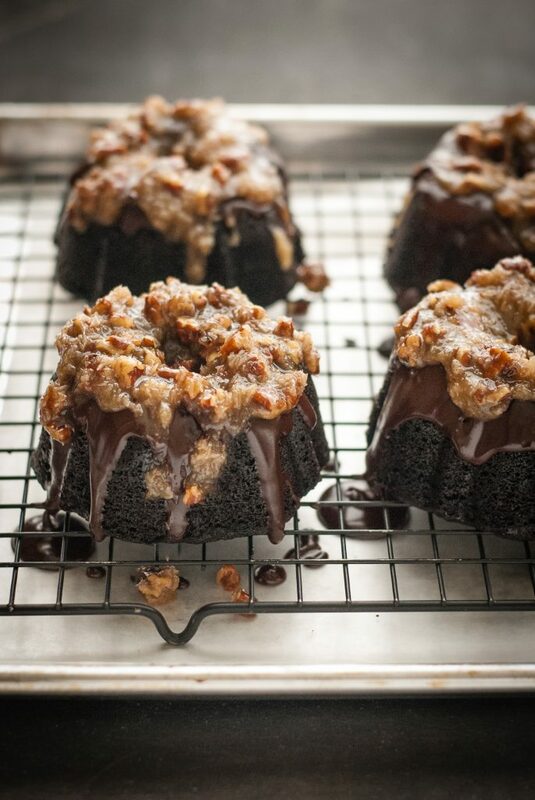 Drizzle cooled cakes evenly with chocolate ganache. 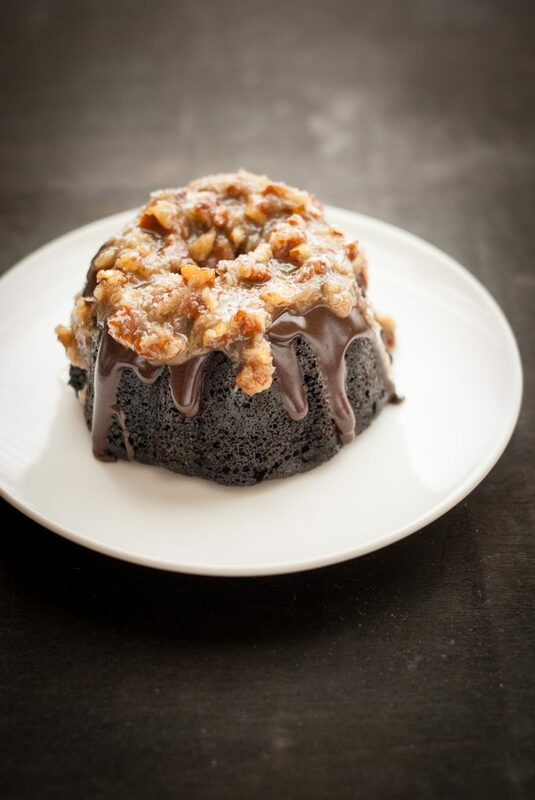 Spoon German chocolate frosting over ganache. Drool. Eat.